Leading into it's 5th Season, fans have long speculated that Green Lantern will show up on The CW's Arrow. And they have certainly been spurned along by a few strategically placed teases and Easter Eggs. We've seen Coast City, heard mention of Ferris Air, and were even introduced to a man in a bar, wearing a flight jacket. His name tag? It read Jordan. Well, guess what? That's as close as you're getting to seeing Green Lantern actually show up on the popular DC Comics series. For the past couple of years, producers and show runners have not been shy about suggesting Green Lantern Corps. is part of the storytelling fabric that makes up the Arrow small screen universe. However, one producer now says that Hal Jordan will never show up. So stop hoping for it. It's not just Hal Jordan, either. None of the Green Lanterns will be shaking hands with Stephen Amell's Oliver Queen, ever. ComicBookResources caught up with executive producer Wendy Mericle to celebrate the 100th episode of the hit show. And she's the one that delivered this devastating news. Cary Pope has been introduced on Arrow as character Susan Williams. This DC Comics mainstay is known for being part of Green Lantern mythology. Asked if the character was chosen for the show for this specific reason, Mericle had this to say. "One of the fun parts of the show is that you can put these characters in and the Easter eggs and the fans that know this universe so well respond to it on varying levels of excitement and whatnot, but the thing about her character that's so intriguing is that it operates on that level. It also operates because she's someone who's very intrigued by Oliver, who's going to uncover some secrets that Oliver has, which is going to be really fun, and is a fun nod to the Green Lantern, who obviously we could never bring on the show." Boom! She drops the bomb that a lot of fans weren't expecting to hear. But perhaps not all hope is lost. When Arrow kicked off five years ago, no one imagined it would lead to the Supergirl, Flash and Legends of Tomorrow crossover event that is happening this season, which is planned as an interplanetary, inter-dimensional adventure. Reminded of this fact, Mericle did provide a glimmer of hope to the Green Lantern situation. "This is 100% true! I mean, really Season 6 and on, all bets are off, right?" 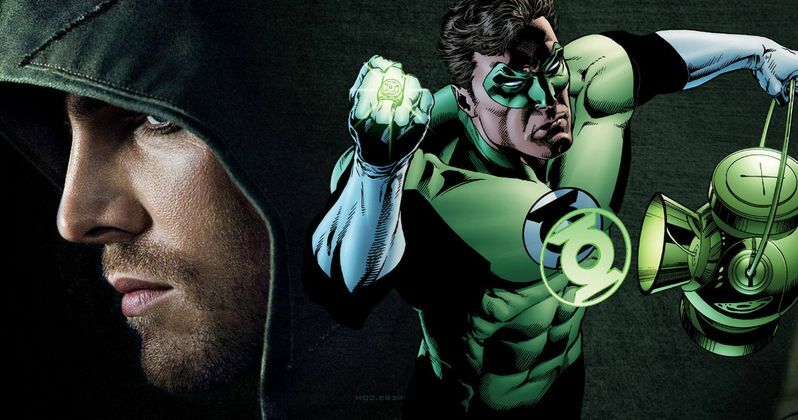 If Supergirl can bring in Superman, why can't Arrow get Green Lantern? That wasn't addressed by the producer. New episodes of Arrow Season 5 will continue to air Wednesdays at 8pm, only on The CW. Who knows what iconic DC superhero or villain might show up next?